This summer, book a 2 night stay on Wyndham's website, WyndhamRewards.com stay the two nights by July 12th and get 2 nights free. If you stay the 2 nights by July 8th you get 2 movies tickets as well plus an Avergers Comic Book. Wyndham has over 6,500 hotels to choose from. 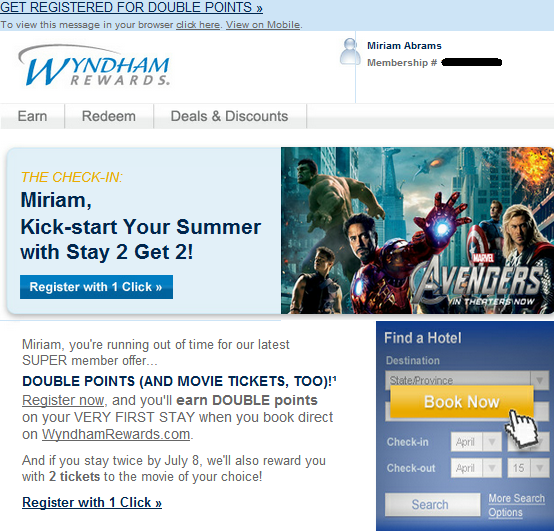 If you have booked your stays at WyndhamRewards.com, then you can earn either double miles or points. Book a stay on wyndhamrewards.com, daysinn.com, ramada.com, wyndham.com, wingatehotels.com, hawthorn.com, super8.com, baymontinns.com, microtelinn.com, hojo.com, travelodge.com, knightsinn.com, dreamintl.com, or nighthotelny.com, at a qualifying rate with arrival dates from March 29 to July 8, 2012 and (iii) complete the stay by July 12, 2012. Registered members can receive double for four (4) separate qualified stays within the Promotion Period (for the first, second, third and fourth qualified stays) with a maximum of 3 rooms per stay. Members should allow six to eight weeks after completion of registration and stay for the bonus points, airline miles or rail points to be credited to their account. Airline mile bonus valid at US airline carriers, Air Canada and AeroMexico only.